bNeurosurgery (G.N.B., B.v.d.P. ), St. Elisabeth Ziekenhuis, Tilburg, the Netherlands. SUMMARY: SDAVFs cause hypertension and hence outflow obstruction in the perimedullary venous system resulting in swelling and edema of the cord followed by dysfunction. Clinical presentation is usually with gradual progressive paraparesis, numbness, and sphincter problems. MR imaging typically demonstrates the dilated perimedullary veins and the swelling and edema of the cord. During the past few years, we incidentally found an SDAVF on MR imaging with dilated perimedullary veins but without swelling and edema of the cord in 5 patients with unrelated presenting clinical symptoms. Spinal angiography confirmed the presence of an SDAVF in all 5 patients. Although the indication was considered questionable, eventually all 5 fistulas were endovascularly or surgically treated, resulting in normalization of the MR images. SDAVFs are rare acquired vascular lesions predominantly affecting middle-aged men. The pathologic arteriovenous shunt between a radiculomedullary artery and a radicular vein is located on the dural nerve sheath and results in venous hypertension, and the outflow obstruction, in turn, causes congestion of the spinal cord with edema, swelling, and dysfunction. The clinical symptoms are a slowly progressive paraparesis with gait disturbance, numbness, and micturition and defecation problems.1⇓⇓–4 MR imaging typically shows a triad of dilated perimedullary veins, cord swelling, and central high signal intensities on T2-weighted images.5⇓–7 In recent years, we discovered that not all SDAVFs present with spinal cord signal abnormality and cord swelling and that SDAVFs may be encountered as incidental findings on imaging studies for unrelated symptoms. In a 10-year period from 2001 to 2011, we encountered 52 patients with SDAVFs in our hospital, and 5 of these (10%) were asymptomatic and incidentally discovered. In this article, we present these 5 cases. All patients were examined by a neurologist and a neurosurgeon and repeatedly discussed in a weekly meeting with neurologists, neurosurgeons, and neuroradiologists. 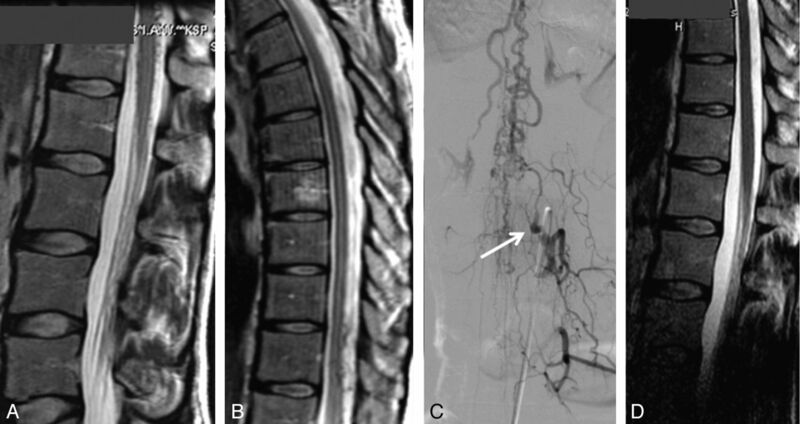 A 63-year-old man with nonspecific chronic low back pain was referred for MR imaging of the lumbar spine, which showed dilated perimedullary veins without swelling or signal changes of the spinal cord (Fig 1). The patient opted for conservative treatment, and follow-up MR imaging findings after 1 and 2 years were unchanged. Because the pain had become worse and the patient insisted on treatment, we finally decided to honor his request, though we found a relation between his nonspecific pain and the fistula unlikely. Spinal angiography revealed an SDAVF on the right L1 level. It was not possible to catheterize the feeding artery, and a small coil was left in the L1 lumbar artery close to the fistula to assist the neurosurgeon in localizing the fistula under fluoroscopy. The fistula was surgically disconnected. Follow-up MR imaging at 3 months and 1 year confirmed permanent disappearance of the dilated perimedullary veins, indicating closure of the fistula. His chronic back pain did not improve and is now regularly treated with physiotherapy. A 63-year-old man with nonspecific chronic lower back pain. A, MR imaging shows dilated radicular and perimedullary veins without myelopathy. B, Angiography reveals an SDAVF at the right L1 level. The fistula was surgically disconnected. A 68-year-old man was referred for MR imaging of the lumbar spine for nonspecific chronic back pain (Fig 2 ). Apart from degenerative spinal changes, dilated radicular and perimedullary veins were observed in the absence of spinal cord signal abnormality. 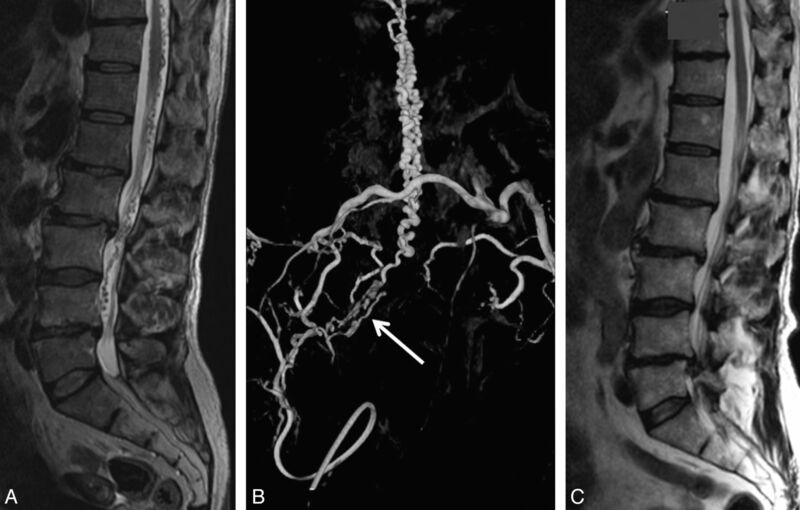 Angiography of the right internal iliac artery revealed an SDAVF originating on the L5-S1 level, with a high flow and extensive dilation of the radicular and perimedullary veins. The SDAVF was occluded with acrylic glue, and on MR imaging 3 months later, no more dilated veins were visible. The pain did not improve. Two months later, the patient underwent an operation on a left L4-L5 disk herniation and became free of symptoms. A 68-year-old man with nonspecific chronic back pain. A, T2-weighted MR imaging shows dilated radicular and perimedullary veins without swelling and edema of the conus. B, Anteroposterior view of a 3D right internal iliac angiogram confirms the presence of a high-flow SDAVF located at the right L5-S1 level. Note retrograde filling of both L5 lumbar arteries. C, MR imaging 3 months after embolization of the fistula no longer shows the dilated radicular and perimedullary veins. Note L4-L5 disk herniation. A 41-year-old woman with Osler-Weber-Rendu disease was referred for MR imaging of the spine for back pain after long-standing exercise on a racing bike (Fig 3 ). Dilated perimedullary veins around the conus and lower cord were present without spinal cord swelling and signal abnormality. Angiography demonstrated an SDAVF on the left L1 level with a high flow and extensive perimedullary drainage in a cranial direction. The fistula was closed with acrylic glue. Follow-up MR imaging findings 3 months later were normal and confirmed permanent closure of the SDAVF. Her clinical symptoms remained unchanged. A 41-year-old woman with Osler-Weber-Rendu disease and nonspecific back pain. A and B, T2-weighted MR imaging shows dilated perimedullary veins around the conus and lower cord without myelopathy. C, Angiography of the left L1 lumbar artery reveals an SDAVF with a high flow and perimedullary drainage in a cranial direction. Arrow indicates the transition point from artery to vein. The fistula was closed with acrylic glue. D, Follow-up MR imaging 3 months later confirms permanent closure of the SDAVF. A 52-year-old woman was referred for a CT angiogram of the carotid arteries after a transient ischemic attack (Fig 4 ). At the C2-C3 level, a pathologic vascular structure suspicious for a cervical SDAVF was noted. Subsequent cervical MR imaging confirmed the SDAVF in combination with a normal cervical cord. 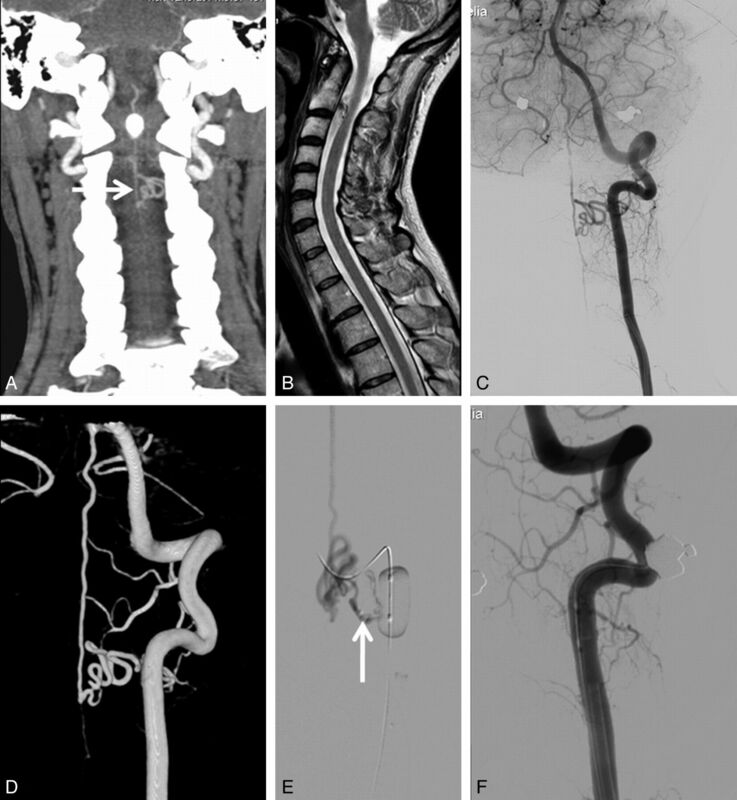 Angiography demonstrated that the slow-flow SDAVF originated from the left vertebral artery with drainage over the perimedullary veins in a cranial direction. A microcatheter was positioned in the arterial feeder, and a mixture of 30% acrylic glue (Histoacryl; Braun, Melsungen, Germany) and iodinated oil was injected under balloon protection of the vertebral artery to prevent reflux. Control angiography confirmed the obliteration of the fistula. A 52-year-old woman with an incidental cervical SDAVF. A, CT angiography of the carotid arteries performed for suspected carotid stenosis shows dilated perimedullary veins at the C2-C3 level. B, MR imaging confirms the dilated perimedullary veins in the presence of a normal cervical cord. C and D, Anteroposterior view of a left vertebral angiogram in 2D (C) and 3D (B) demonstrates the SDAVF with drainage in cranial direction. E, Superselective angiogram through the microcatheter (arrow) just before glue injection under balloon protection of the vertebral artery. F, Complete obliteration of the cervical SDAVF. A 71-year-old man was referred for MR imaging of the lumbar spine for nonspecific chronic back pain (Fig 5 ). 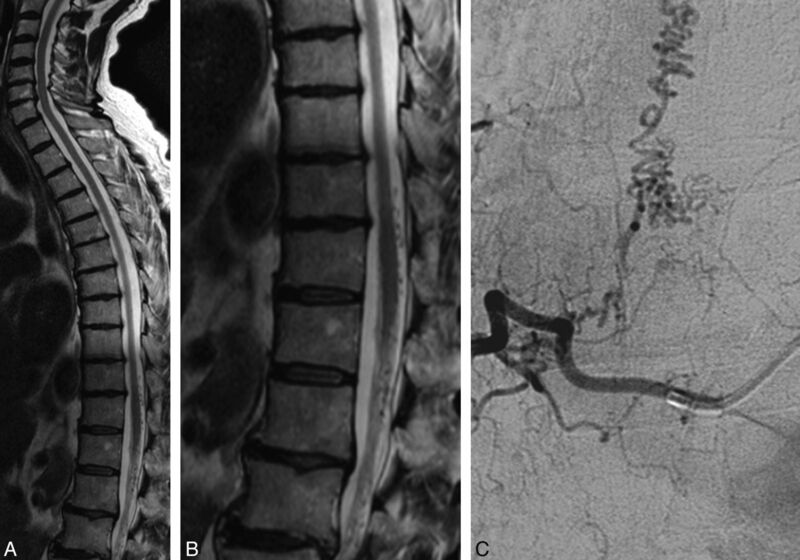 Next to a mild degenerative spinal canal stenosis at the L2-L3 and L4-L5 levels, dilated radicular and perimedullary veins were present in the absence of spinal cord swelling and signal abnormality. MR angiography depicted the origin of the SDAVF on the right T8 level, which was confirmed by spinal angiography. The SDAVF was surgically closed. At follow-up, symptoms did not improve. A 71-year-old man with nonspecific lower back pain. A and B, T2-weighted MR imaging shows dilated perimedullary veins around the conus and lower cord without myelopathy. C, Spinal angiography shows an SDAVF at the right T8 level. Diagnosis of an SDAVF is established with MR imaging with a classic picture of dilated radicular and perimedullary veins in combination with spinal cord signal abnormality and swelling of the cord. However, apparently, an SDAVF may exist without cord abnormalities and without symptoms related to the fistula. 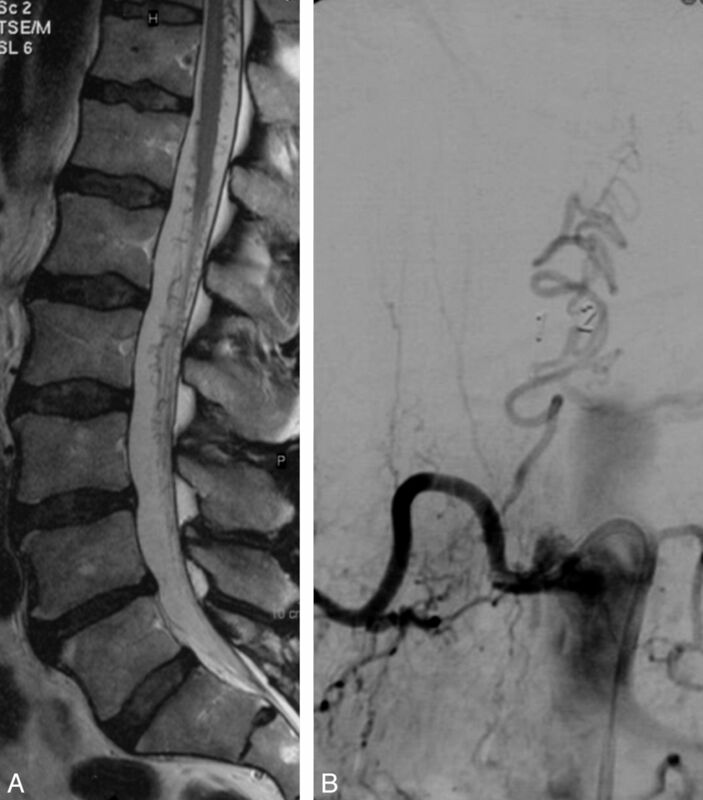 In our 5 patients, an SDAVF was demonstrated on MR imaging confirmed with angiography as an incidental finding with no relation to the presenting clinical symptoms and without myelopathy. Our patients presented with nonspecific pain syndromes. Pain is not a prominent symptom of SDAVFs. At the time of diagnosis of an SDAVF, most patients have symptoms of cord dysfunction such as paraparesis and sphincter disturbances; a small minority of patients also have pain. Pain as the only symptom of an SDAVF probably does not occur.3 In all 5 patients, treatment of the SDAVF did not relieve the presenting pain symptoms. With increasing use of MR imaging, more incidental SDAVFs may be encountered in clinical practice. The natural history of an asymptomatic SDAVF is not known, and it is not clear whether surgical or endovascular treatment is indicated. In 3 of 5 of our patients, the angioarchitecture of the SDAVF was favorable for endovascular treatment, and that was the main reason to proceed with embolization. In 1 patient (case 1), endovascular treatment was not possible and a policy of wait and scan was finally abandoned because of increasing back pain. The fistula was surgically treated, but clinical improvement did not occur. In all 5 patients, the dilated perimedullary veins returned to normal caliber on follow-up MR imaging after endovascular or surgical treatment indicated successful and permanent closure of the pathologic arteriovenous shunt. Whether this treatment improved the prognosis of our patients remains unanswered because knowledge of the natural history of incidental SDAVFs without myelopathy is lacking. Because SDAVFs are very rare and incidental SDAVFs are extremely rare, we advocate publication of anecdotal cases that can eventually be reviewed in a meta-analysis. To our knowledge, our cases are the first in the literature. Accepted after revision January 21, 2012.